The Farr 230 is a trailerable, one design sportboat designed by Farr Yacht Design. 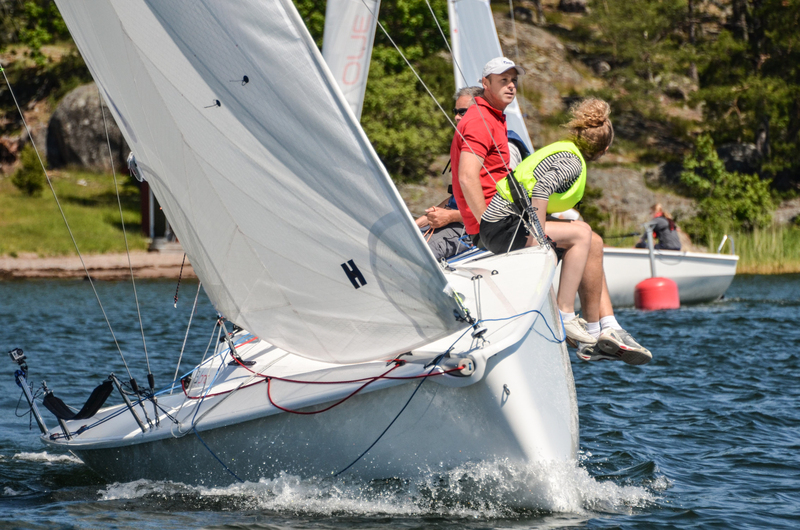 This ready-to-sail package includes a fully commissioned, assembled boat, a Triad trailer, and Hyde main and jib. The Farr 230 is easy to launch and rig, has simple controls, an asymmetrical spinnaker and lifting keel. 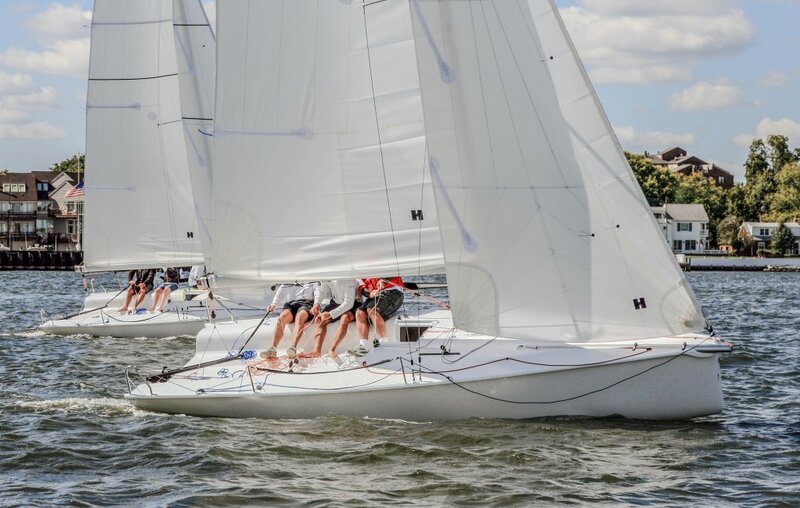 It is a proven PHRF 2 winner with a competitive 126 rating. The hull shape clearly shows the influence and direct descent of the Farr 400 and Volvo Open 70 in its full bow shape, broad and powerful stern sections, and chined aft topsides. These features combine to provide exceptional speed, optimal balance, and solid, dependable handling in all conditions. The maximum beam limit for trailering (2.5m) is seamlessly integrated into the hull and deck detailing to conceal fittings, provide a smooth, rounded deck edge, and maximize crew weight stability. Inspired by the sleek look of larger, modern high-performance one designs such as the Farr 400, the deck is flush with only a slightly raised cabin top to create the necessary headroom down below and contain the required sailing functions on deck. The cockpit is wide and open providing plenty of room for crew maneuvers during racing or seating for friends and family on a weekend harbor cruise. 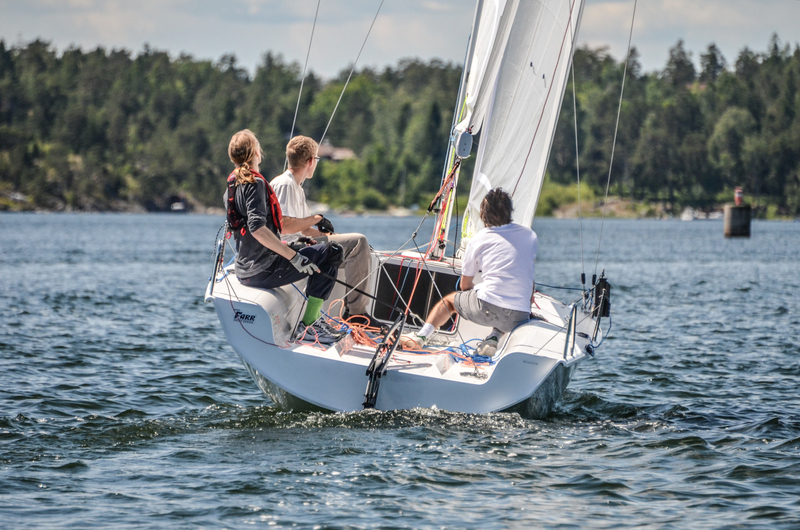 Sail handling is performed without winches or excessive hardware, but while still providing all the necessary sail controls demanded by advanced one-design sailors, including adjustable jib tracks and a powerful boomvang. The large, round foredeck hatch provides ample light and ventilation to the interior, and serves as the opening for launching and retrieving the spinnaker via a string takedown system. The waterproof companionway cover hinges completely forward providing a large opening to the interior. The cover can also be partially opened to cover the horizontal surface of the companionway while still providing ventilation to the interior via the open vertical surface. The hull shell is hand laminated using E-glass chopped strand mat and multi-axial fabrics over Coremat with additional uni-directional reinforcements used in high stress areas. The deck shell also is hand laminated using E-glass chopped strand mat and multi-axial fabrics over a PVC foam core with additional uni-directional and multi-axial reinforcements used in high stress areas. The hull shell support is provided by a simple one-piece structural liner composed of transverse floors and a centerline longitudinal. The keel trunk is integrated into the structural liner allowing for easy movement through the interior. The single spreader, tapered aluminum rig has swept spreaders and does not require a backstay. Calibrated shroud turnbuckles allow for easy and quick tuning changes. The mast is deck stepped for quick and easy rigging. Mast bend is controlled with a powerful 16:1 boomvang. The jib is set on a furler for ease of handling. The square-headed mainsail features a generous roach profile for maximum sailplan efficiency. The bowsprit retracts into an external recess in the foredeck, thereby eliminating the possibility of water ingress into the boat which commonly occurs on other boats of this size. The keel/bulb arrangement on the Farr 230 is a T-keel style configuration, as featured on most of today’s high tech racing yachts. The keel’s down draft is 1.65m (5.41ft) and may be raised to an up draft of only 0.4m (1.31ft) for docking, anchoring, or trailering. In its raised position the keel passes through a separate opening in the deck, forward of the main companionway, making it possible to completely lock the companionway cover closed, thereby securing the boat with the keel raised. The retractable rudder is supported inside a transom mounted cassette and may be raised for docking or anchoring in shallow waters. The Farr 230 is an exciting 7m (23ft) trailerable, one-design sportboat. This is an economical one-design that has excellent performance, and is easy enough to handle and operate for weekend sailors and their families. Farr Yacht Design has met these requirements with a technologically advanced hull shape developed from the Volvo Open 70 and Farr 400, an easy to use sailplan, and interior features you would expect to find on a boat 3 feet longer. 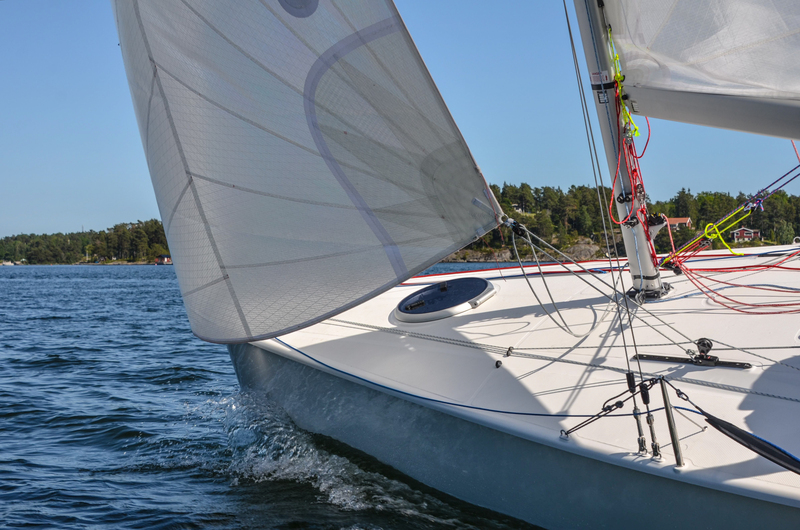 The Farr 230 has the power to weight ratio to perform well both upwind and downwind. The 34m2 (377ft2) of upwind sail area is set on an aluminum mast. The 48m2 (517ft2) asymmetrical spinnaker flies on a 1.3m (4.3ft) retractable bow sprit providing plenty of downwind horsepower. The keel and rudder are retractable making docking or anchoring in shallow water possible. The retractable keel also makes slip launching a breeze and allows for very low trailering heights, so that the boat can be towed by a relatively small vehicle. The Farr 230 promises to be an absolute delight to sail and operate with unique features from bow to stern.